Community choice aggregation (CCA) offers an option for cities, counties, and collaborations to opt out of the traditional role of energy consumers. Instead, they can become the local retail utility, buying electricity in bulk and selecting their power providers on behalf of their citizens in order to find lower prices or cleaner energy (or even reduce energy demand). 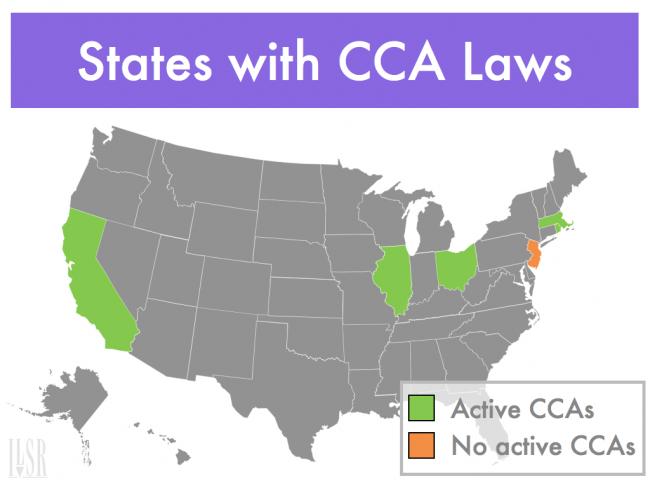 Only four states have CCA laws on the books – Ohio, Rhode Island, Massachusetts, and California. Most have only a single CCA; California has none. There’s a reason. Incumbent electric utilities aren’t big fans of CCAs. In California, the CCA law passed in 2002 but utilities like Pacific Gas & Electric (PG&E) have stymied the development of local CCAs, even sponsoring a ballot measure – Proposition 16 – to require towns to get a two-thirds super majority to create a CCA. The measure was narrowly defeated (with a 52% vote) despite $46 million spent by PG&E to steamroll local choice. The ballot measure was only the latest in a series of attempts by PG&E to quash community choice, dating back to the utility’s bankruptcy and $8 billion bailout in 2001-02. Advocates are continuing the fight with new legislation to clarify what was meant in the original law when utilities were ordered to “cooperate fully” with communities seeking to establish a CCA. The CCA difference can be significant. Ohio’s largest CCA offers customers prices averaging 5% lower than the incumbent utility. And CleanPowerSF, the CCA certified (but not yet operational) for the City of San Francisco intends to get 51% of its power from renewable sources by 2017. You can read more about Community Choice Aggregation in our 2009 policy brief.